Squires Gate suffered defeat on Saturday when they went down 3-0 to 1874 Northwich. 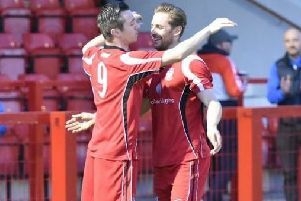 For the first time in three seasons, Gate had gone into the game knowing they didn’t need a win to preserve their Premier Division status. After losing against Runcorn Linnets last time out, Gate saw Finley Clarkson start in place of Max Rothwell (knee). Their visitors had an early penalty appeal waved away after the ball struck Alex Colquhoun’s chest before keeper Ben Fletcher had to be alert to keep out a snap shot. Gary Pett spurned two chances for Gate, who fell behind on 32 minutes when Sam Hind turned and fired home. Pett and Dean Ing both saw efforts saved by 1874 keeper Greg Hall as they led by one goal at the break. Pett and Ryan Riley had chances but 1874 doubled their lead as Hind headed in from Ryan Jackson’s cross. Gate looked to reply but saw Pett direct his header the wrong side of goal before the same player was denied again by Hall. Jake Parker made it three for 1874 when he fired past Fletcher at the far post. Gate are next in action on Monday as they host Burscough in their last game of the season.